Sandy beach, pavilion, playground area, wonderful swimming. Located a short distance from the hotel. This 14-acre park is located on Horseshoe Bay, south of Egg Harbor. 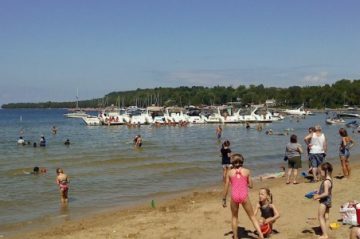 Notable features include 1,600 feet of sandy beach, boat launching facilities, a dock, picnic area, volleyball court and playground area. Parking and toilet facilities are available. A rocky shoreline and spectacular water sprays. An all-time Door County favorite.